Explain purchasing power parity’s importance when comparing countries. The foreign exchange market involves firms, households, and investors who demand and supply currencies coming together through their banks and the key foreign exchange dealers. 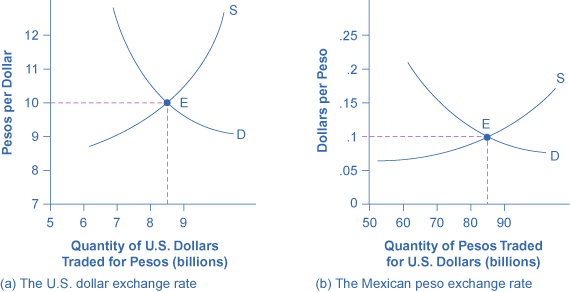 Figure 1 (a) offers an example for the exchange rate between the U.S. dollar and the Mexican peso. The vertical axis shows the exchange rate for U.S. dollars, which in this case is measured in pesos. The horizontal axis shows the quantity of U.S. dollars being traded in the foreign exchange market each day. The demand curve (D) for U.S. dollars intersects with the supply curve (S) of U.S. dollars at the equilibrium point (E), which is an exchange rate of 10 pesos per dollar and a total volume of $8.5 billion. 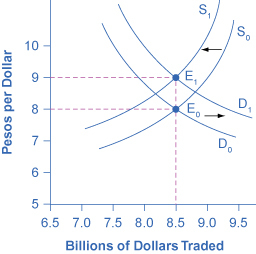 Figure 1 (b) presents the same demand and supply information from the perspective of the Mexican peso. The vertical axis shows the exchange rate for Mexican pesos, which is measured in U.S. dollars. The horizontal axis shows the quantity of Mexican pesos traded in the foreign exchange market. The demand curve (D) for Mexican pesos intersects with the supply curve (S) of Mexican pesos at the equilibrium point (E), which is an exchange rate of 10 cents in U.S. currency for each Mexican peso and a total volume of 85 billion pesos. Note that the two exchange rates are inverses: 10 pesos per dollar is the same as 10 cents per peso (or $0.10 per peso). In the actual foreign exchange market, almost all of the trading for Mexican pesos is done for U.S. dollars. What factors would cause the demand or supply to shift, thus leading to a change in the equilibrium exchange rate? The answer to this question is discussed in the following section. One reason to demand a currency on the foreign exchange market is the belief that the value of the currency is about to increase. One reason to supply a currency—that is, sell it on the foreign exchange market—is the expectation that the value of the currency is about to decline. For example, imagine that a leading business newspaper, like the Wall Street Journal or the Financial Times, runs an article predicting that the Mexican peso will appreciate in value. The likely effects of such an article are illustrated in Figure 2. Demand for the Mexican peso shifts to the right, from D0 to D1, as investors become eager to purchase pesos. Conversely, the supply of pesos shifts to the left, from S0 to S1, because investors will be less willing to give them up. The result is that the equilibrium exchange rate rises from 10 cents/peso to 12 cents/peso and the equilibrium exchange rate rises from 85 billion to 90 billion pesos as the equilibrium moves from E0 to E1. Figure 2. Exchange Rate Market for Mexican Peso Reacts to Expectations about Future Exchange Rates. An announcement that the peso exchange rate is likely to strengthen in the future will lead to greater demand for the peso in the present from investors who wish to benefit from the appreciation. Similarly, it will make investors less likely to supply pesos to the foreign exchange market. Both the shift of demand to the right and the shift of supply to the left cause an immediate appreciation in the exchange rate. The motivation for investment, whether domestic or foreign, is to earn a return. If rates of return in a country look relatively high, then that country will tend to attract funds from abroad. Conversely, if rates of return in a country look relatively low, then funds will tend to flee to other economies. Changes in the expected rate of return will shift demand and supply for a currency. For example, imagine that interest rates rise in the United States as compared with Mexico. Thus, financial investments in the United States promise a higher return than they previously did. As a result, more investors will demand U.S. dollars so that they can buy interest-bearing assets and fewer investors will be willing to supply U.S. dollars to foreign exchange markets. Demand for the U.S. dollar will shift to the right, from D0 to D1, and supply will shift to the left, from S0 to S1, as shown in Figure 3. The new equilibrium (E1), will occur at an exchange rate of nine pesos/dollar and the same quantity of $8.5 billion. Thus, a higher interest rate or rate of return relative to other countries leads a nation’s currency to appreciate or strengthen, and a lower interest rate relative to other countries leads a nation’s currency to depreciate or weaken. Since a nation’s central bank can use monetary policy to affect its interest rates, a central bank can also cause changes in exchange rates—a connection that will be discussed in more detail later in this chapter. Figure 3. Exchange Rate Market for U.S. Dollars Reacts to Higher Interest Rates. A higher rate of return for U.S. dollars makes holding dollars more attractive. Thus, the demand for dollars in the foreign exchange market shifts to the right, from D0 to D1, while the supply of dollars shifts to the left, from S0 to S1. The new equilibrium (E1) has a stronger exchange rate than the original equilibrium (E0), but in this example, the equilibrium quantity traded does not change. If a country experiences a relatively high inflation rate compared with other economies, then the buying power of its currency is eroding, which will tend to discourage anyone from wanting to acquire or to hold the currency. 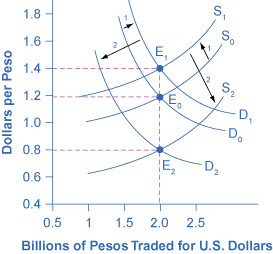 Figure 4 shows an example based on an actual episode concerning the Mexican peso. In 1986–87, Mexico experienced an inflation rate of over 200%. Not surprisingly, as inflation dramatically decreased the purchasing power of the peso in Mexico, the exchange rate value of the peso declined as well. 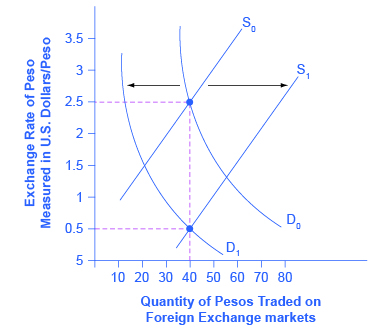 As shown in Figure 4, demand for the peso on foreign exchange markets decreased from D0 to D1, while supply of the peso increased from S0 to S1. The equilibrium exchange rate fell from $2.50 per peso at the original equilibrium (E0) to $0.50 per peso at the new equilibrium (E1). In this example, the quantity of pesos traded on foreign exchange markets remained the same, even as the exchange rate shifted. Figure 4. Exchange Rate Markets React to Higher Inflation. If a currency is experiencing relatively high inflation, then its buying power is decreasing and international investors will be less eager to hold it. Thus, a rise in inflation in the Mexican peso would lead demand to shift from D0 to D1, and supply to increase from S0 to S1. Both movements in demand and supply would cause the currency to depreciate. The effect on the quantity traded is drawn here as a decrease, but in truth it could be an increase or no change, depending on the actual movements of demand and supply. Visit this website to learn about the Big Mac index. In the extreme short run, ranging from a few minutes to a few weeks, exchange rates are influenced by speculators who are trying to invest in currencies that will grow stronger, and to sell currencies that will grow weaker. Such speculation can create a self-fulfilling prophecy, at least for a time, where an expected appreciation leads to a stronger currency and vice versa. In the relatively short run, exchange rate markets are influenced by differences in rates of return. Countries with relatively high real rates of return (for example, high interest rates) will tend to experience stronger currencies as they attract money from abroad, while countries with relatively low rates of return will tend to experience weaker exchange rates as investors convert to other currencies. In the medium run of a few months or a few years, exchange rate markets are influenced by inflation rates. Countries with relatively high inflation will tend to experience less demand for their currency than countries with lower inflation, and thus currency depreciation. Over long periods of many years, exchange rates tend to adjust toward the purchasing power parity (PPP) rate, which is the exchange rate such that the prices of internationally tradable goods in different countries, when converted at the PPP exchange rate to a common currency, are similar in all economies. Suppose that political unrest in Egypt leads financial markets to anticipate a depreciation in the Egyptian pound. How will that affect the demand for pounds, supply of pounds, and exchange rate for pounds compared to, say, U.S. dollars? Suppose U.S. interest rates decline compared to the rest of the world. What would be the likely impact on the demand for dollars, supply of dollars, and exchange rate for dollars compared to, say, euros? Suppose Argentina gets inflation under control and the Argentine inflation rate decreases substantially. What would likely happen to the demand for Argentine pesos, the supply of Argentine pesos, and the peso/U.S. dollar exchange rate? Does an expectation of a stronger exchange rate in the future affect the exchange rate in the present? If so, how? Does a higher rate of return in a nation’s economy, all other things being equal, affect the exchange rate of its currency? If so, how? Does a higher inflation rate in an economy, other things being equal, affect the exchange rate of its currency? If so, how? What is the purchasing power parity exchange rate? If a country’s currency is expected to appreciate in value, what would you think will be the impact of expected exchange rates on yields (e.g., the interest rate paid on government bonds) in that country? 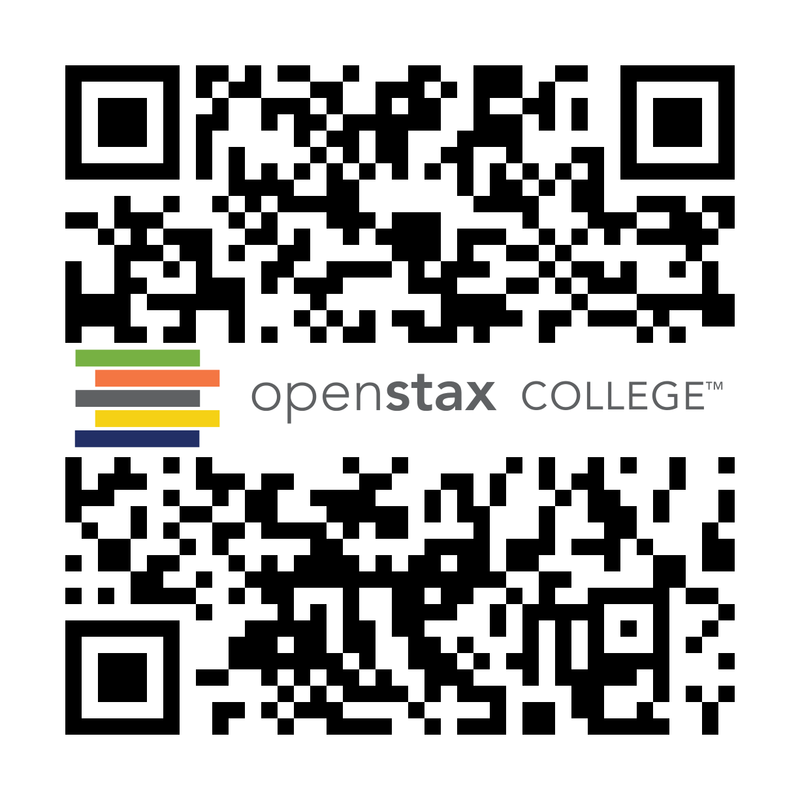 Hint: Think about how expected exchange rate changes and interest rates affect demand and supply for a currency. Do you think that a country experiencing hyperinflation is more or less likely to have an exchange rate equal to its purchasing power parity value when compared to a country with a low inflation rate? Expected depreciation in a currency will lead people to divest themselves of the currency. We should expect to see an increase in the supply of pounds and a decrease in demand for pounds. The result should be a decrease in the value of the pound vis à vis the dollar. Lower U.S. interest rates make U.S. assets less desirable compared to assets in the European Union. We should expect to see a decrease in demand for dollars and an increase in supply of dollars in foreign currency markets. As a result, we should expect to see the dollar depreciate compared to the euro. A decrease in Argentine inflation relative to other countries should cause an increase in demand for pesos, a decrease in supply of pesos, and an appreciation of the peso in foreign currency markets. 29.2 Demand and Supply Shifts in Foreign Exchange Markets by Rice University is licensed under a Creative Commons Attribution 4.0 International License, except where otherwise noted.